When Linnaeus chose the name for Agave, he based it on the Greek word agauos, which means “illustriously noble” or admirable.” Like many of the names Linnaeus gave, it has many meanings, also referencing the Greek goddess Agave, the daughter of Harmonia. The name reflects the auspicious appearance of the flower stalk, which ascends nine to twelve feet, and is replete with bright flowers during the bloom period from May to June. Lechuga, Spanish for “lettuce,” with the diminutive form illa, meaning “little,” gives this tough, spiky plant its species and common names, although in truth it’s not very much like lettuce. The name “shindagger” seems more appropriate. Indeed, the dense colonies of lechuguilla in the Chihuahuan Desert were one of the perils that Spanish conquistadors complained of, with their animals’ feet and legs, as well as their own, suffering greatly from the one- to two-inch spines on the tips of the knee-high leaves. The flowers emerge into glory when the plant matures at ten to twenty years of age. The flowering stalk begins its life within the “heart” of a rosette of thickly succulent leaves, forming in response to time, light, and nutrients, which, at the right moment, collectively give the signal, “Agave, start flowering!” After a few months of splendor, the plant dies, and a number of its clones (see photo) develop to carry the past into the future. The color of the tepals (petals and sepals that are identical in appearance) range from yellow to red, with the red filaments of the well-exserted anthers giving the flowers a preponderantly red color. The fruit is oblong and about an inch long. Lechuguilla grows in rocky limestone soil in several plant communities from 2,800 to 6,200 feet elevation, including grasslands, creosote bush, and pinyon-juniper. An indicator plant for the Chihuahuan Desert, its presence defines the boundaries of this desert, whose northern limits are in southern New Mexico. Reproduction is almost entirely vegetative, with large areas covered by clonal groups. The root system is very shallow, from two to four inches deep, and up to three times wider than the main mass of the clonal group. This allows the plants to absorb significant quantities of water from even brief rainfall events. Another of its drought-tolerance adaptations is the chemical composition of the leaves and roots, which contain large amounts of salts, mucilage, and saponin compounds, all of which prevent dehydration. Every part of lechuguilla played a useful role in the life of American Indians living in the Chihuahuan Desert. The short inner core, or stem, to which the leaves are attached, contains large quantities of carbohydrates, along with the toxic saponins. Native Americans cooked this “heart” in a pit for two full days to destroy the saponins, then formed the flesh into sweet cakes or fermented it into an alcoholic drink. 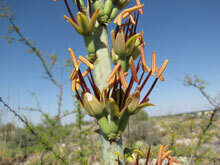 The cakes were eaten fresh, or dried and stored for months like those of sotol, Dasylirion wheeleri. The leaves contain hard fibers, called istle or ixtle, that Indians used to make baskets, rope, sandals, brushes, and clothing. Archaeological excavations in the Lower Pecos Canyonlands have uncovered artifacts indicating the use of lechuguilla fibers at least eight thousand years ago. Today istle is known commercially as Tampico fiber. Extracted by small operators in Mexico, it is used for making rope, brushes, mats, and carpets. Native Americans used the dried flower stalks for construction of walls and roofs of houses, fishing poles, spear shafts, and firewood. The saponins in lechuguilla make a mild detergent that gently cleans the hair and skin, as well as delicate fabrics. In the past, the saponin-containing stems and leaves were powdered and used to stun fish for easy capture, while juice from the leaves and stems provided a poison for arrow tips. One of lechuguilla’s saponins is smilagenin, which is receiving some attention today for its use in treating cognitive disorders, including Alzheimer’s disease. Another is hecogenin, a raw material in the synthesis of cortisone. Lechuguilla is lethal to domestic sheep, goats, and cattle; poisoning usually occurs when drought conditions prevail and range condition is poor. Sheep and goats are particularly affected, becoming lethargic, anorexic, and jaundiced; experiencing swollen mucous membranes; and excreting yellow fluid from the eyes and nose. Mule deer eat the young flower stalks and baby plants with impunity, and collared peccaries (javelinas) consume the tender leaves of the growing point, the base of leaves that are on the outside, and the roots. Pocket gophers also eat the inner core at the growing point. Many small mammals call lechuguilla home, and it provides cover and nesting sites for many species of birds, lizards, and snakes. Lechuguilla’s stately inflorescences make it a popular feature in desert xeriscapes. The nectar of lechuguilla flowers is popular with an assortment of bees, beetles, butterflies, wasps, and hummingbirds. Lechuguilla is a larval host and nectar source for the Mary’s giant-skipper butterfly (Agathymus mariae). Agave lechuguilla hybridizes with other Agave species, including A. parryi subsp. neomexicana and A. havardiana, to create intergrading populations. Rocky Mountain bee plant is a three-foot-tall, somewhat bushy annual with long racemes of flowers that bloom from July to September. The stamens are exserted well past the petals, giving it a “spidery” appearance. The leaves are palmate, with three leaflets, and when they are crushed, they give off an unpleasant smell. 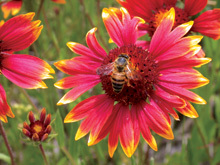 Bee plant grows in northern and western New Mexico, in disturbed areas from 4,500 to 8,000 feet elevation. New Mexico’s ancient inhabitants ate the seeds, which archaeologists have found in coprolites and burial sites. Today bee plant is an indicator of Indian ruin mounds. The Acoma and Laguna gathered the seeds, cooked them, and then spread them out to dry for winter use. The Isleta ground the seeds into flour for making bread; others ground them into a meal for mush. The present-day Hopi cultivate bee plant in their fields to ensure a source of greens in the spring and seeds later on. High in iron, calcium, and vitamin A, bee plant leaves have been called “Indian spinach.” The Navajo boil the greens in at least two changes of water before eating them. They also enjoy the leaves mixed with onion and meat in a stew. Other Native Americans grind the seeds together with corn to make bread, or even chop the entire plant to mix with cornmeal to make cleome cornbread. The people of the San Ildefonso and Santa Clara Pueblos made a leaf tea to treat stomach problems. The warm leaves also were used to poultice sores and wounds. 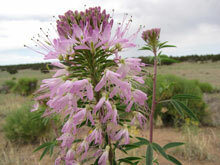 The Navajo used cleome to treat ant bites, and they still use it as both food and medicine for the Night Way Ceremony. Somewhat ironically, they made a shoe deodorant from the smelly leaves—fighting fire with fire! The plant’s high iron content made it valuable as a pigment for painting pottery. The leaves were boiled and then pressed down and dried into bricks. This substance, called “guaco,” could later be reconstituted with water and used to draw black or gray designs on pottery prior to firing. A yellow-green dye for wool is made by soaking the yarn for two weeks in fermenting Cleome leaves. The flowers yield a lilac dye. Bee plant is recommended as a garden ornamental not only for its fanciful appearance but also because it hosts a multitude of insect species, including bees and butterflies that feed on its nectar and pollen. It is also useful for stabilizing disturbed or damaged land and for highway beautification projects. Doves and other small birds eat the seeds. Bluebonnets became the Texas state flower in 1901. There are five species of genus Lupinus making Texas their home, and in 1971 state lawmakers decided to embrace them all as the state flower(s). Two of these are shown following the text. Despite the name, bluebonnets are not always blue; some species or varieties have pink, maroon, or white petals. Each new flower has a white spot, and careful observation will reveal that on some of the flowers this white spot has turned red, indicating that it has already been pollinated and is on its way to making a seedpod. All lupines have palmately compound leaves. To grow bluebonnets in a home garden, plant the seeds in the fall. They will germinate with fall rains and grow through the winter as a rosette, or cluster of leaves hugging the ground. When the days lengthen, so will the flowering stalk, and the plant will begin to flower sometime in March or April. Bluebonnets will reseed themselves thereafter if conditions are favorable. Many lupines contain dangerous alkaloids, but bluebonnets are “sweet”—that is, their alkaloid content is low--making them a desirable forage plant. The Navajo people believed that lupines were a cure for sterility and would help a man produce female children. They also ground the roots and applied the paste to skin wounds. Wool may be dyed a light yellowish-green by simmering it with bluebonnet flowers, although colorfastness is a problem. Legends abound about how the lovely bluebonnet came into existence. One story explains that the flowers are chunks of sky knocked down by warriors fighting in the Happy Hunting Ground. Another legend is about an Aztec maiden who was being sacrificed to appease the gods. She dropped her blue headdress to the ground, and the next day there were blue flowers growing there. A third well-known myth says the flowers arose from the ashes of a doll sacrificed by a little girl to bring the rains back to her tribal lands. 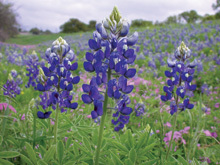 Two other bluebonnet species include L. concinnus, annual lupine, which is the least flamboyant of the lupines, and L. havardii, Big Bend bluebonnet, which is larger and more robust than other species. Occasionally one sees white or pink bluebonnets, which show recessive genes for alternative colors. Examples of these are shown in the Exploring Further pages, along with typical palmately compound leaves and seedpods. The genus Gaillardia was named for the well-to-do French lawmaker of the 1700s Gaillard de Charentonneu, who funded botanical research and exploration. The name “Indian blanket” comes from an old legend about a blanket weaver who wished to thank the Great Spirit for his many gifts. The old man used the colors of the sunset in weaving the most exquisite blanket he had ever made. At his request, he was buried in this yellow, red, and brown blanket so that he could present it as a gift to his Maker. In return, the Great Spirit covered the land with this flower, which displays all the colors of the sunset, just like the blanket. An ancient Aztec legend tells a different tale of how this flower came to be. According to this story, the Indian blanket was once pure yellow before the coming of Hernán Cortés, but the center became stained red with the spilled blood of the Native Americans he conquered. This famous drought-tolerant annual is now a well-known ornamental in gardens throughout the United States, although the larger and more robust G. grandiflora is showier and longer lasting. Kiowas thought this flower would bring them good luck and kept it in their homes. Many tribes used a tea from this plant as a diuretic to relieve water retention and to treat urinary problems. Pale green and bright yellow dyes can be extracted from the flower heads, depending on the compounds used to fix the colors.